Ancient people sacrificed offerings to water god at edge of sacred pool. Exploration of Belize's Cara Blanca pools has revealed an increase in rain god offerings during a time of drought. 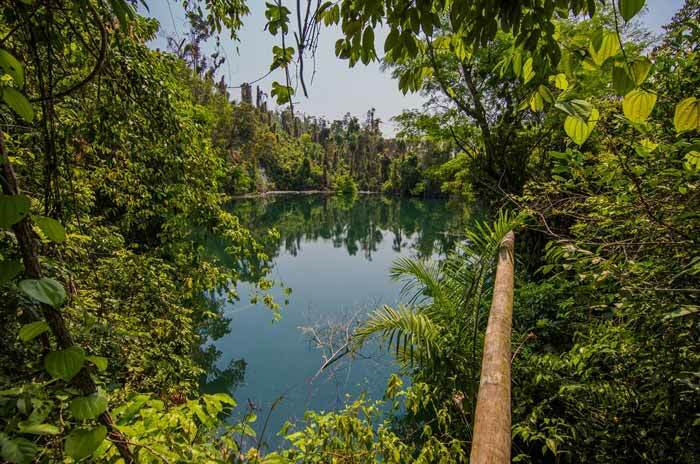 Nestled in a quiet forest in Belize, a deep aquamarine pool holds ruins from a time when the ancient Maya turned to a "drought cult," archaeologists suggest, and hurried sacrifices to a water god to try to stave off the fall of their civilization. At the Cara Blanca site in Belize, archaeologists report the discovery of a water temple complex: a small plaza holding the collapsed remnants of a lodge and two smaller structures. The main structure rests beside a deep pool where pilgrims offered sacrifices to the Maya water god, and perhaps also to the demons of the underworld. Beneath Cara Blanca's white cliffs, pilgrims sacrificed pots, jars, and bowls to the temple pool's depths. The sacrifices apparently came from both near and far, pointing to the ruin as a place where people from across the region came to pray for rain. "The pilgrims came there to purify themselves and to make offerings," says University of Illinois archaeologist Lisa Lucero, who led the team that explored the ruins. 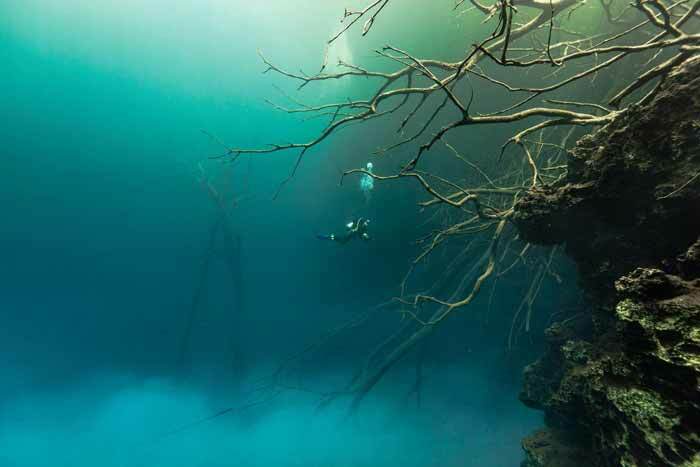 She has plumbed the depths of the cenote, or natural pool, for four years, finding long-lost offerings of ceramics and stone tools in its depths. "It was a special place with a sacred function," she says. But the temple wasn't always so busy, a paucity of early offerings suggests. That may point to the time when the Maya's need to placate Chaak, the rain god who lived in the depths, grew dire. In an upcoming Cambridge Archaeological Journal report on the temple, Lucero and archaeologist Andrew Kinkella of Moorpark College in California note that offerings picked up at the shrine only after widespread drought had engulfed the ancient Maya world. 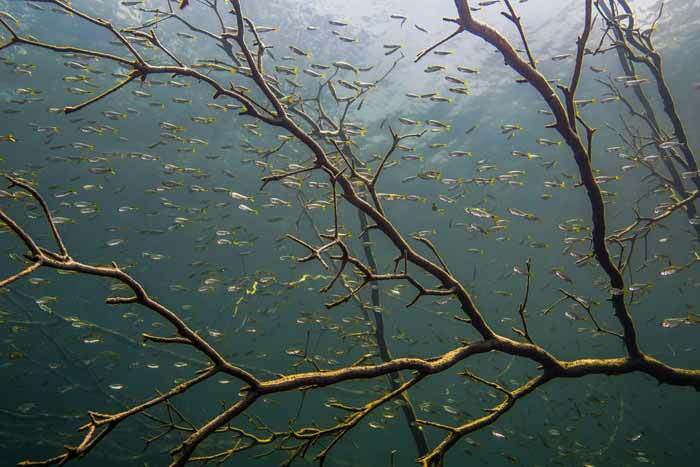 Divers explore sunken trees amid clouds of particulate matter in a pool at the Cara Blanca site, where Maya pilgrims once sacrificed pots, jars, and bowls. But it would seem that Chaak and the evil gods of the underworld set the Maya up for their fall, with the rain they gave and then withheld. Penn State anthropologist Douglas Kennett and colleagues have reported that stalagmite records show that high rainfall likely led to a Maya population boom that lasted until A.D. 660. That in turn set up their kingdoms for a fall when the rain stopped. Near the large Maya city of Caracol in Belize, for example, Moyes and her colleagues have explored the ruin of Las Cuevas, with support from the National Geographic Society. Beneath one of the site's largest pyramids, a large cave mouth opens. The cave's huge entry chamber also has a cenote, as well as an underground river, that likely served as a ceremonial site. 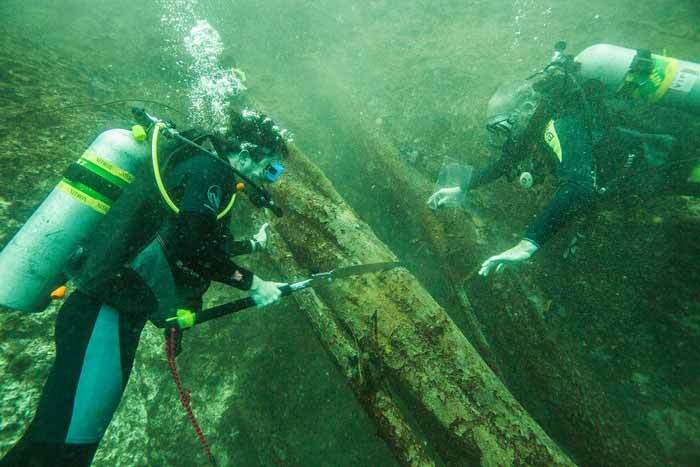 Scientists collect wood samples for carbon dating from trees at the bottom of a pool at Cara Blanca. Even in good times, the Maya deposited offerings in caves and bodies of water, says archaeologist Brent Woodfill of the University of Minnesota in Minneapolis. They also transplanted stones and other odds and ends from caves, he adds, intended to imbue ball courts, temples, and other ceremonial structures with sacredness. Similar sacred qualities might explain why the water temple at Cara Blanca appears to be partly constructed from the cenote's tufa stone. During its construction, the floors of the shrine were sprinkled with a blanket of sacrificed potsherds and fossil teeth or claws dredged up from the pool, as well. Small water jars predominated among the ceramics. Some were painted with a water motif of wavy lines and spirals, and one bowl was painted with a jaguar, associated with water and caves in Maya mythology. The offerings largely date from the "terminal" era of the ancient Maya, the study says, when cities were largely abandoned. "This is the first example I've seen where people were actually pulling out rocks and fossils from the bottom of pools and cenotes to incorporate into temple architecture," Woodfill says. "This is fascinating, and once again shows how closely caves and pools were related in the Maya worldview." Other caves visited by the drought cult are similarly adorned with blankets of potsherd offerings, Moyes says. Human sacrifices also may have started to appear during that time in the deep recesses of the underworld's caves, the home of Chaak. Differing from the study authors, Moyes sees the water shrine offerings as more likely dating to the era just before the collapse of the ancient Maya civilization, rather than afterward. "In the big picture, I do agree this was likely a shrine where ritual practices took place that point to times getting tough for people," Moyes says. "When you start getting down to actual drought, we are starting to see sacrifices picking up across the Maya world." For more on the ancient Maya, read "The Maya: Glory and Ruin" in National Geographic magazine.